The stacker crane is the heart of an automated warehouse system capable of operating 24 hours per day. 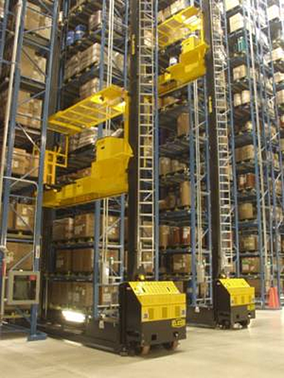 Automated stacker crane systems require fewer human operators and are able to create extreme storage density and operate in very narrow aisles. Watch this video to understand how a stacker crane moves. The accurate positioning of a stacker crane is critical to its operation. The crane must be positioned accurately in order to execute the task of automated picking and packing. Stacker cranes must be thoroughly tested for maximum uptime, low maintenance, and extremely high safety standards. The many benefits of an automated stacker crane storage system are dependent on accurate positioning, and this is why absolute encoders are critical to their successful operation. The Solution: Why Nidec-Avtron Absolute Encoders? Nidec Avtron offers a full range of absolute encoders with special features to assist stacker crane OEMs and end-users. For OEMs, the AV6A and the AV6M encoders offer cost-effective and space-saving durable designs. The unique Wiegand wire technology in the AV6M enables multi-turn applications without the use of batteries, glass disks, or plastic gears. All of the latest field busses are supported, such as SSI, Ethernet, DeviceNet, Profibus, CANOpen, and CANSafe Options. 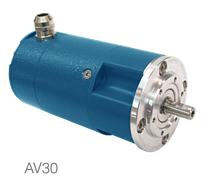 End users can directly retrofit earlier OEM models with heavy duty units such as the AV30 that will fit the existing flanges with no modifications. Interested in regular updates on absolute encoder applications? Sign up for our blog update here. This blog is dedicated to finding and eliminating encoder failures on heavy duty industrial equipment.